The holidays are coming! – Write with us! A chill has arrived in the Barrington area. Cool mornings have seen the temperature drop into the 40s this past week. With the cooler air comes a natural inclination to huddle into your home, nestle up on the couch with a blanket and read a good book, watch football, or make a comforting stew. These happy fall customs are the prelude of what’s to come in the next few months – the holidays. While the Christmas decorations in stores showing up in September can be an annoyance, it truly is never too early to think about holiday cards. With kids back in school and sports, picking out the holiday card early (and perhaps the holiday photography too) will take away some stress come November. With every year feeling more like a race against time to get presents wrapped, the house decorated, and meals cooked, planning ahead is your best friend. 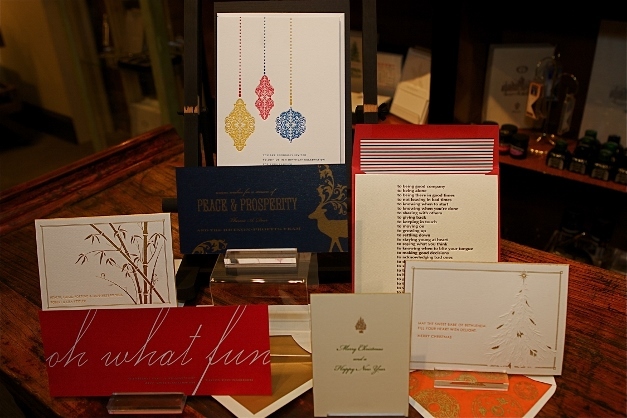 We have the new holiday card collections for personal and business from Checkerboard, Bell’Invito, Dempsey and Carroll, and The Printery. Our cards can accommodate photos, include letterpress, raised ink, and engraved options, and come in designs which welcome greetings of all cultures and religions. Most importantly, they represent that warm hello which we all want our loved ones or clients to feel around the holidays, while also looking stunning on the fridge, foyer table, or wall. Take a look at the personal cards here and business cards here on our Facebook page, and make sure to stop in early so we can customize everything to your liking. Next Post Add Beauty to Your Home and Gifts – Take Our Calligraphy Class!